The new sign which measures 650mm X 650mm has been designed to be seen from a distance in the daylight or at night. It is fitted with a 110 volt supply and comes with a large emergency blue flashing beacon. It enables managers to communicate highly visual warning safety messages to their workforce and monitor noise levels over both the day and night shifts. SafeEar MAX comes with a data-logging and downloading facility as standard allowing the operator to record what noise levels are being generated over time and identify which operatives are being exposed. Reports generated show if noise levels are exceeding the levels set by a given local authority or in line with the noise regulations. Any recorded data can be used to confirm if complaints are justified with regard to noise from the site. This simple, cost-effective product used in conjunction with hand held noise monitors and personal noise dosemeters provide any user with a comprehensive and unique noise exposure management system as part of their overall physical agent monitoring strategy. 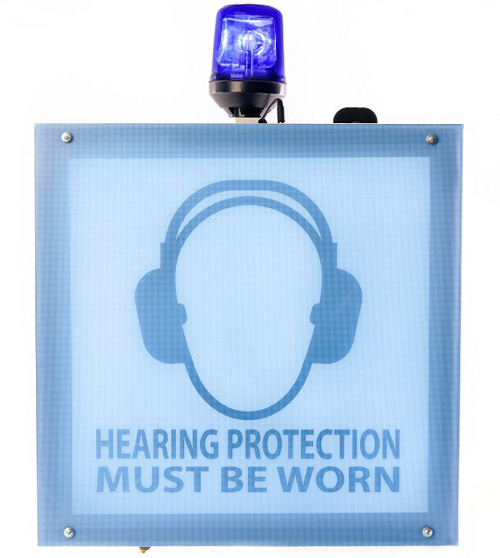 SafeEar MAX is best used mounted on walls or vertical structures in selected zones around a construction site, a factory or warehouse to improve awareness of harmful levels of noise and provide important data on noise exposure levels. •	110v site power supply as standard.